We woke up a couple weeks ago to a funky haze and a smell that was not typical of Iowa. 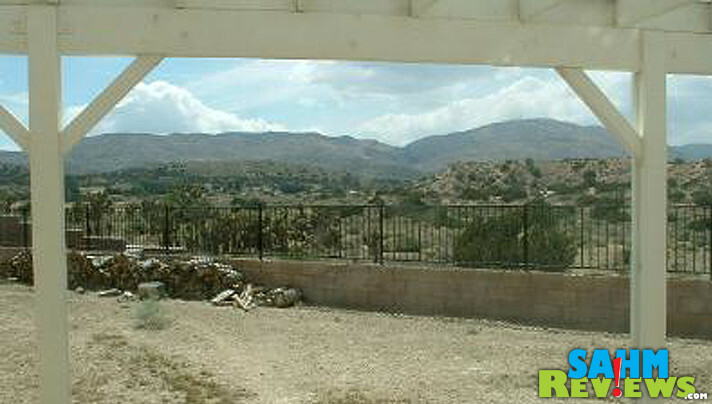 But I recognized the sadly familiar scene from our days of living outside of Los Angeles. It was the lingering effect of the wildfires scorching through Canada. While most of the country had been focused on the hurricanes pounding the southern states, we were keenly aware of the concerns our friends in Los Angeles, Portland and elsewhere were dealing with. Fires move and waft at their discretion and even homes that are miles away need to prepare for a potential shift. As we stood and looked out our back window of our home outside of Los Angeles many years ago, I remember the glow surrounding the mountains and the haze in the air. We didn’t expect that it would move close to us, but fires are unpredictable so we didn’t take anything for granted. Fires were a regular occurrence, but they happened more than you might think. It’s sad to see the damage to the landscape and felt sympathy for those who lost their homes. Watching air tankers doing continuous sweeps to contain or control the fire was always a somber reminder of how severe the situation was. We had lived there for several years before I heard that firemen known as hotshots often drop behind or into the fire to chop down trees, create firebreaks and try to gain some control over the fire. 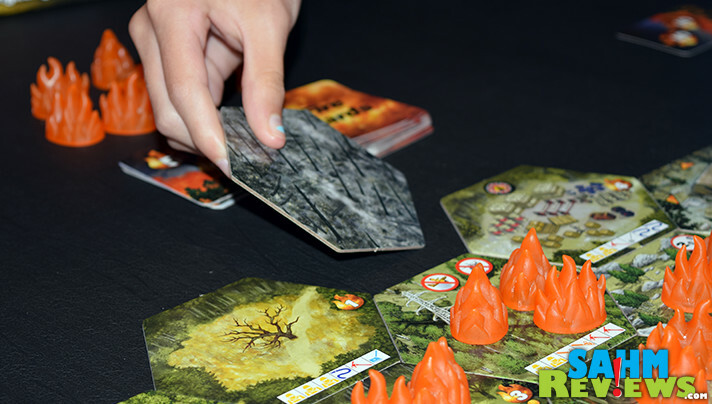 Yet it wasn’t until I played Hotshots game from Fireside Games that I understood all the different parts and pieces that go into fighting these fires. The rulebook is filled with explanations of the origins of tool names like Pulaski and McLeod in addition to inspirational quotes about these brave individuals. 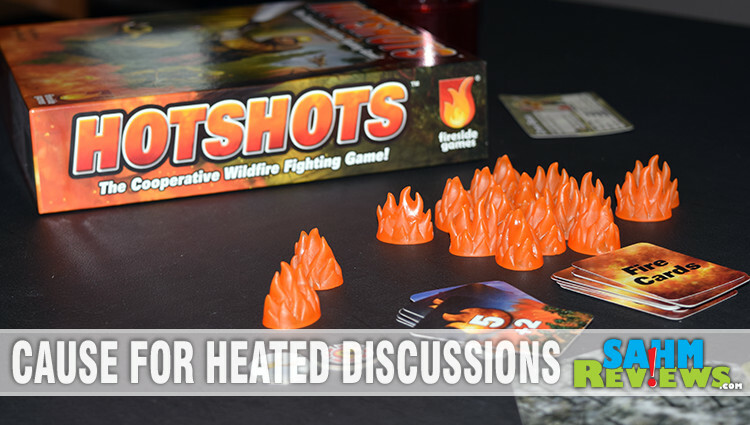 What sparked my interest even more is that Hotshots is a cooperative game and you know how I feel about those. With everyone working together to achieve the same goal, nobody walks away as sole loser. Either everyone wins or everyone loses. 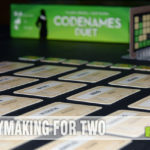 The only type of game that holds a candle to a cooperative (in my book) is a dice game. 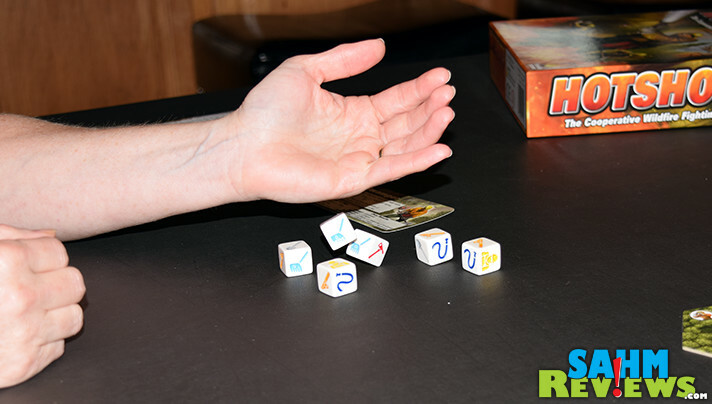 And guess what… Hotshots has dice, too. 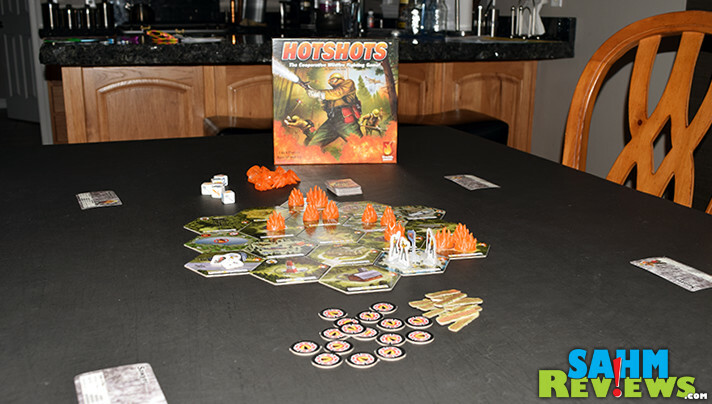 Accommodating between 1 and 4 players, Hotshots consists of 19 tiles that feature locations and terrain, custom dice, 3-D flame meeples, four characters, fire cards and various Reward tokens. The tiles are placed face up in one of the example patterns provided in the instruction book and populated based on specific starting marks on the tiles. As you get more experienced, you can arrange them however you like, but the starting flames will always begin on the same tiles no matter where they are placed. 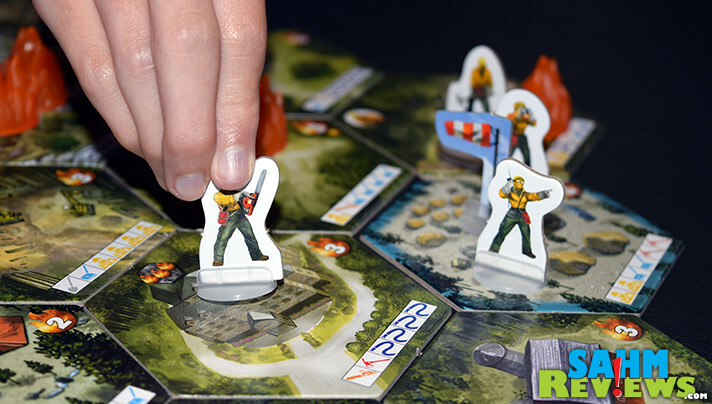 Players takes on the role of one of the crew, each with a special ability that involves changing the dice roll, moving people or peeking at the upcoming Fire Cards. These crew member specialties are important benefits, but if the team fails to control the outbreaks, these abilities may be lost. 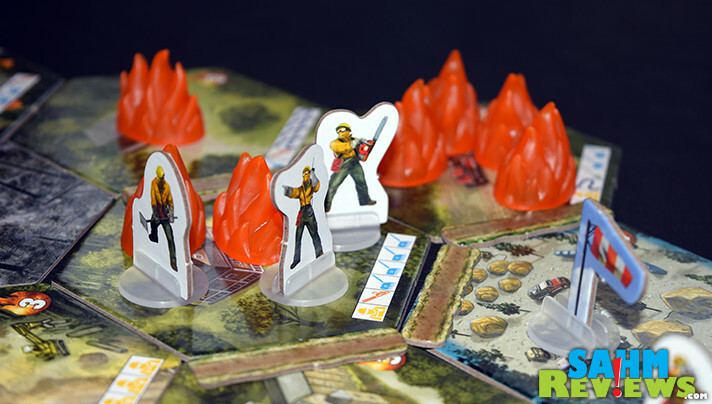 Additional bonuses that can be earned included dice re-rolls, recovering lost dice, moving extra tiles and dropping Firebreaks to stop embers from passing into an adjoining region. On your turn, you’ll take three actions. First, move up to two spaces. You don’t have to move, but if you do you are limited by terrain and placement of fire. You cannot pass through a fire without stopping to fight it. Kind of makes sense, doesn’t it? You can, of course, share spaces with other crew members – there are actually benefits to doing so. The next action is to fight the fire by rolling the dice. Each tile displays six icons which represent the dice results that must be attained on that particular space. You’ll roll and as long as you match at least one icon, you can continue to roll. 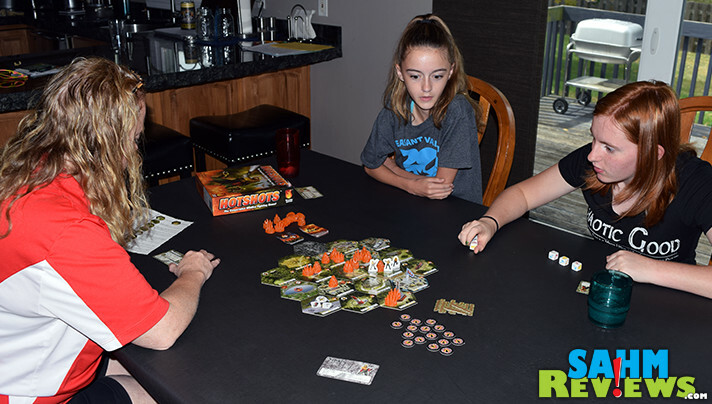 Some tokens allow for a re-roll and each supporting crew member on that same tiles gives an additional “missed” roll benefit. If you’re able to match 3 dice faces to the requirement, you can place a Firebreak. Match 4 and you can remove one Flame. Successfully roll 5 icons and you can remove two Flame tokens in addition to placing a firebreak or drawing a Reward token. Attaining all 6 allows you to remove 3 Flame tokens, place a Firebreak AND grab a reward token. It’s tempting to try to maximize the benefits on your turn, but the penalties if you don’t… ugh. 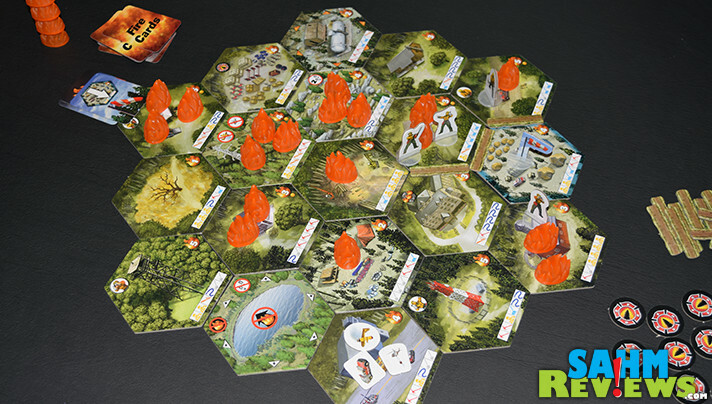 If you choose to play with fire and press your luck but FAIL to meet a new dice requirement then you cause a Blowup. Blowups negate the work you’ve already accomplished this turn and cause another flame token to be placed on that space. So why is it a big deal if more flames land on a space? Each tile has a specific purpose. One is the Fire Camp, one is the Air Attack Base (which houses special firefighting vehicles) and others are associated with each crew member. On every tile is a scorch level that represents how many flames that tile can hold before it becomes a complete loss. If it was the Fire Camp, the game is over. If it belonged to one of the players, they lose their special ability. When 8 tiles are scorched, the game is over. Did I mention that if a firefighter is standing on a tile when it’s scorched then even more bad stuff happens? Well, it does. 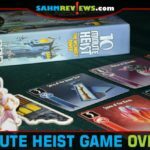 You lose a die for each Hotshot on the tile and they lose one Reward token they had been saving. The third action you take is to draw a Fire Card. These lovely little things represent nothing good. They cause the wind to shift, gusts to cause flames to fly, sparks to ignite on new tiles and fires to increase in severity. At the end of every player’s turn, one of these is drawn so it’s important to communicate with other players to do as much damage control as possible the entire game! Not only does Hotshots put into perspective how dangerous a forest fire can be, but it also teaches the importance of working together. Be among the first in your game group to have this newly released title by picking up a copy Hotshots game on Amazon. 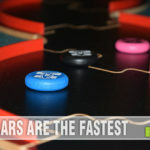 You can find out what else Fireside Games has cooking by reading up on their Facebook and Twitter news. Unfortunately, yes. It’s not something you want to see, it’s chaos. I have never witnessed a Forest Fire, but I have witnessed a Wild Fire , here in Southern California! I remember watching the mountain, behind our house…on the other side of a Reservoir, burning, and the Helicopter drops and the Fire Fighters setting back fires! I live in CA so they are all around me. Saw one on a mountain pak real close to my house once. Pretty crazy. We almost had to evacuate! Thankfully, I have not witnessed one. I love these kind of games, thank you! Yes, we have a season and permanent road signs “Fog Smoke Ahead”. Luckily have never had one close to our home. Living in California it’s almost unavoidable. I’ve had to evacuate a couple of times, but thankfully the fire didn’t get too close. I haven’t, and hope to never do! A number of years back we were one of the last cars to pass through Yellowstone before they closed the roads due to a big ol’ forest fire. That was the closest I’ve been to a wildfire. We’ve watched them on TV, that is as close as we’ve gotten. No. I have never witnessed a forest fire. No and I hope I never do. I know several people in or from Montana who’ve told me about the fires out there this year, and the amount of damage they’ve caused is tragic. 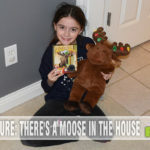 I have not, but I’ve seen it on the news. Thank god I have not. I see them on the news and my heart aches for those have lost their homes and been through something like that. Experienced forest fires living in South Dakota. Stinky mess with ash falling on our house for several days.